Available Now Through All Major Digital Retailers! With several acclaimed projects under their collective belt, New York rap duo Dirt Disciples have amassed a discography that more than speaks for itself. And whether you’re new to the work of Elmira, NY’s Rome Clientel and Long Island’s DJ Concept, or have been following them from jump, you’ll find plenty to love about their latest effort. 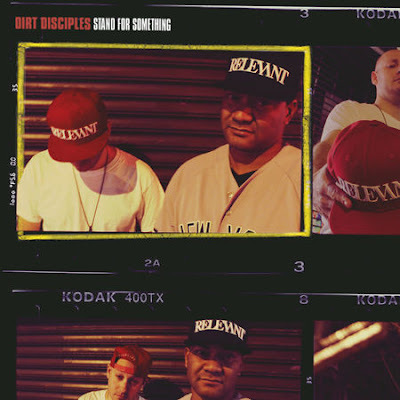 Stand For Something is a 10-track compilation that boasts all-new material, previously unreleased joints, and slept-on collaborations from their catalogue. “Even the joints that were leaked, or were featured on other artist’s releases may not have gotten the play they deserved,” Concept says, pointing to notable slappers like 2014’s “Love Is Love” featuring Chaundon. That track actually holds a special place in the heart of Dirt Disciples, who met years ago through Rome’s work with Chaun. For Rome, he was especially excited about putting together the standout remix to Nas classic “It Ain’t Hard to Tell.” The emcee talks of how impressive it was that Concept made the track his own while remaining true to the original’s feel. “That’s next to impossible to do, and it proves why our chemistry is sonically so great,” Rome adds. That chemistry is evident no matter which track off Stand For Something ends up being your favorite, and chances are it’ll be difficult to narrow it down to just one. And who knows, by the time you do, the two may have a new project for you to throw on repeat. In addition to Chaundon, Stand For Something includes guest features from Skyzoo, Rick Gonzalez (f/k/a Realm Reality), DJ Eclipse, and AC on Demand, among others, and is available now through all major digital retailers and streaming platforms via Crisis Center Collective.